The reborn Nokia launched its first salvo of smartphones back in July. The Nokia 3, 5 and 6 have now all become available to interested buyers - but they were all decidedly lower-to-midrange designs. Those wondering about or wishing for a flagship follow-up device may be happy to hear that today the firm has launched the Nokia 8. So what is Nokia headlining as a particular strength or USP of the Nokia 8 - to stand out among the smartphone crowd? The firm hopes that as well as competitive standard flagship components such as a Qualcomm Snapdragon 835 SoC, 4GB LPPDDR4X RAM, 5.3-inch IPS QHD screen, and 64GB UFS2.1 storage etc, the unique imaging abilities of the Nokia 8 will win hearts and minds of purchasers. Nokia wants to invent the #Bothie and popularise the use of both front and rear cameras simultaneously with its 'Dual-Sight' mode. This goes beyond front/back simultaneous still photography, which is a common feature now. Nokia's mode allows "live video streaming to Facebook Live and YouTube Live with a single touch". This allows users to share "both sides of the story". Furthermore, Nokia has leveraged its OZO technology here to allow for spatial 360 degree audio recording while recording up to 4K video. Previously we heard that Nokia / HMD had struck up a new deal will Zeiss optics and that comes into play here too. The 13MP dual image-fusion rear camera, with both colour and monochrome sensors, plus the wide-angle 13MP phase detection auto-focus front camera use Zeiss optics for super slim forms and excellent photo capture. The rear camera has an f/2.0 lens with dual-tone flash and OIS. The selfie camera also has an f/2.0 lens and flash. Other high-end niceties delivered by the Nokia 8 include; its mono-block 6000 series aluminium construction, a splashproof polished mirror finish to the product, the 2K polarised display with Gorilla Glass 5, up-to-date Android Nougat 7.1.1 with regular updates promised. 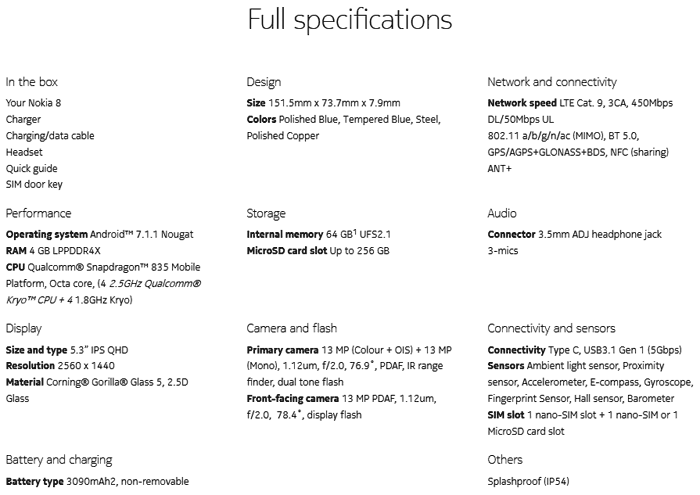 For the full specs check the table below. 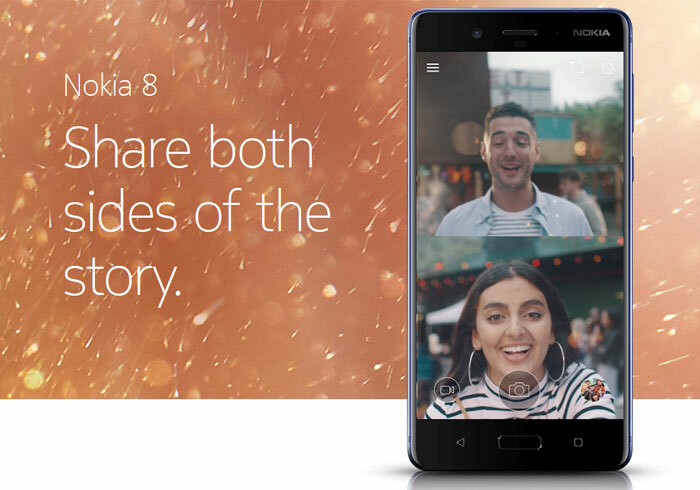 The Nokia 8 will hit retail early next month with SIM-free pricing said to be €599 (£545). Reminds me of the Nokia Lumia 735 or whatever it is we have for work mobiles, where the reviews were basically, “Err…. takes awesome Selfies and…. err…. umm… well, yeah…. sorry, that's all we can think of”. Not exactly a unique phone, they might have been Windows Phone, but at least the Lumia's had some unique, if not a little gimmicky features to go with them. What's so special about having both cameras at once, I'm sure there are 100 apps to do that already. Why does a phone have to be “unique”? Isn't it enough if it does what it does really well? Note, I'm not saying that's how it is. Proper in-depth reviews will tell us that. TBH, I could've done without that “bothie” dual cam feature, and instead having the phone have either a replacable battery or better water proofing (the phone is only IP54 certified). One thing to note is that the Nokia 8 apparently comes with an almost stock version of Android, which should make for relative quick updates (fingers crossed). They are indeed promising updates the same day they come out (for security ones). Not sure about OS updates, but they're making the right noises. Why does a phone have to be “unique”? Isn't it enough if it does what it does really well?